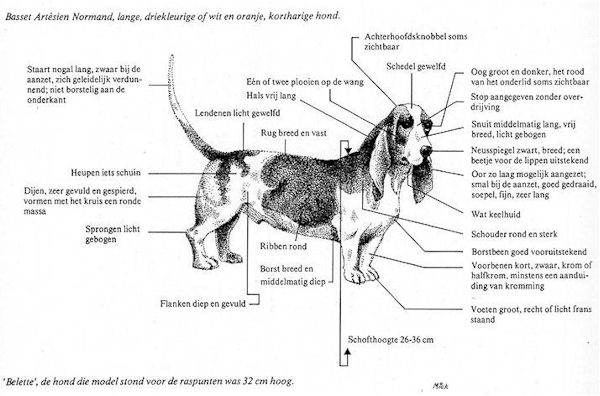 Characteristics of the breed of French Basset. The Basset Artésien Normand is a low, solid hound with a long body-structure. Mostly they are tri-coloured: black, white and brown. He has a beautiful noble head with striking eyes and long pliable hanging ears. He shows power and at the same time elegance. A hound full of style. His height of the withers is between 30 and 36 cm. An adult Basset weighes around 18 kg. The features of his appearance is formally described in the breeding standard.